Looking out over the seemingly endless Serengeti plains, Serengeti Sopa Lodge is a hillside lodge in a tranquil oasis set in over 14,000 sq kms (5,000 sq miles) of National Park. The Serengeti plains are host to a dramatic annual migration of hundreds of thousands of wildebeest and numerous other species of animals indigenous to the area. The lodge offers game drives to view wildlife in the park. Serengeti Sopa Lodge is located in the Nyarboro Hills in the south west of the Serengeti National Park and is the only tourism development in this section of the park. Year round water and the acacia woodland in this area create an ideal environment for the wide variety of wildlife seen in the immediate vicinity of the lodge. The lodge has magnificent views over the Serengeti plains. The lodge has 69 rooms and 4 twin-storey suites. Each of the rooms has a lounge area with a mini bar, a bedroom with two queen size beds and ample room for a third, an en-suite bathroom. They also have balconies with stunning views over the plains. The suites are still more spacious and have bedroom and bathroom on the upper floor and a sitting and dining area with an outdoor terrace beneath. Open: Serengeti Sopa Lodge is open all year. Location: Serengeti Sopa Lodge is in the Nyarboro Hills on the edge of an escarpment overlooking the plains of the southwestern Serengeti National Park. The nearest airstrip, Seronera, is a 45 minute drive from the lodge. Rooms: There are 69 standard rooms with a living room and balcony. Rooms are decorated with local fabrics and pictures. They have minibars, mosquito nets and storage space for clothes. The en-suite bathrooms have showers and flush toilets. There are also 4 suites with spacious accommodation over 2 floors. They have a downstairs lounge, dining area and veranda and an upstairs bedroom and bathroom. They also have outdoor showers. 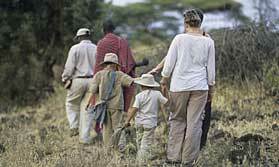 Activities: The lodge offers game drives in the national park. Facilities: There is a large outdoor swimming pool. The spacious dining area is above the reception and has floor to ceiling windows looking over the Serengeti plains. Most meals are served buffet style. There is also an outdoor dining area. Boxed meals are provided for guests spending the day game viewing. The bar and lounge have similar views and an outdoor terrace. There is a coffee bar and a TV and video room. The lodge has a gift shop. There is a laundry service and a currency exchange. Children: Children of all ages are welcome. Babysitting and children’s meals can be arranged. Communication: There is Wi-Fi in the communal areas and computers that can be used for a charge. An exciting African safari & beach holiday for the whole family. Wildlife of north Tanzania then 5 days on Zanzibar. "Again well situated lodge but too many people and became very noisy- a bit like a holiday camp. i would not stay here again and sensitive tourists would not like this if the hotel is full as it becomes very congested and quite unplesant. Would have preferred smaller hotel or camping but we did make this choice bacause it was the rainy season..etc so not complaining just...commenting!" "Amazing location. Good food and excellent service." "Much the same as Ngorongoro .but no (need for) hot water bottles! Great views across the park from our window." "Amazing views over the Serengeti and once again we were always greeted and made to feel so welcome."